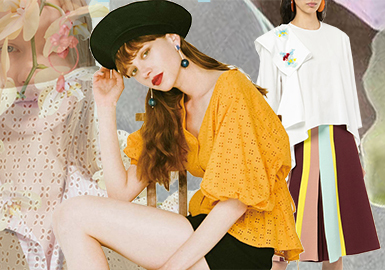 Large silhouettes, silk kerchiefs, mock layer, visual misplacement and Chinese fashion style, and interesting cartoon patterns are all key elements. Sweatshirt is hot because of its versatile quality and fashion feature. Multi-dimensional and changeable designs are integrated. The casual and comfortable features are eye-catching. The long-sleeved design combines functionality and fashion. 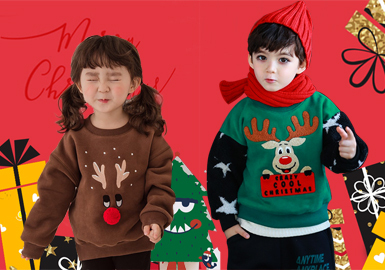 Lace, velvet and sequin make stylish sweatshirts female. The now hottest hole and mock-layer style shows the fashion and slouchy individuality to the full. Dresses in December focus on simple and elegant style. X line is prominent, and paneling is key. 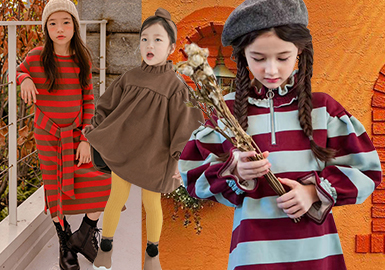 Natural or deconstructed cotton and linen design, vivid girl, Harajuku style, athleisure and simple elegance are main styles in the Japanese market of this season. They contribute to the diversity of womenswear. In addition to leisure design, sporty and sweet styles are also widely used in sweat dresses. The addition of chiffon, lace and ruffle emphasizes a vivid feel. Sporty splicing, word, webbing and zipper also characterize looks. Comfortable long-staple cottons and scuba knits are important materials for sweatdresses, with prints, panels and checks to bring freshness. 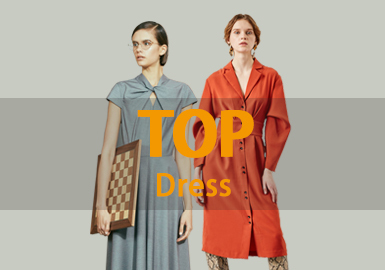 Based on the data of hot womenswear in August and psychological needs of consumers, we provide an analysis of three key styles for womenswear on Tmall. 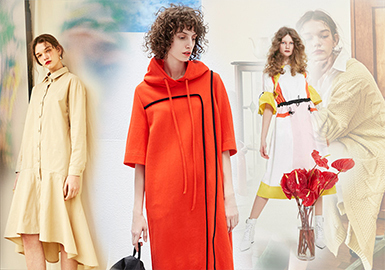 In pre-fall 2018 markets, dresses are still prominent and vary in styles. Girly chic, sporty, sophisticated and cotton-linen design are key. Tweed dresses in classic silhouettes bring freshness. Simple and sophisticated style is also prevalent in the Hangzhou market. 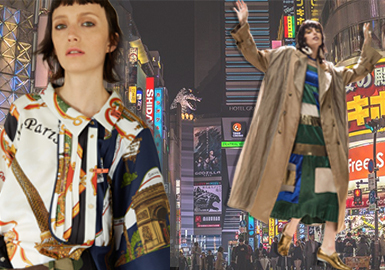 Plaid coats, suits, skirts, trousers and cotton-linen trench coats are versatile. 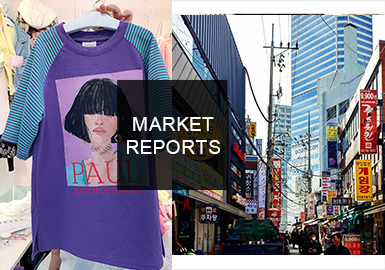 There are new design features in the Korean markets for young and mature women. This report focuses on details, including deconstructed cuff, spliced sleeve and exposed stitch. 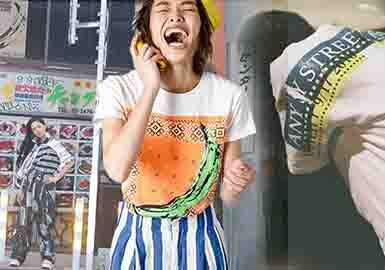 We analyze key items to help you stay up on the latest trends. Ruffled neck, cuffs and sleeves exude a sweet and retro aesthetic. Lace fabrics and contrast colors add depth. 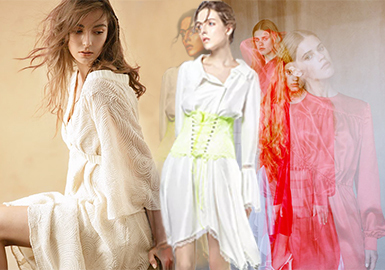 To summarize and analyze the pre-fall 2018 market, the key words are as below: unique lace, gauze paneling at shoulder, partial smocking, decorative stitch and sketchy illustration. The design is more delicate and elegant, providing diverse styles for early autumn. 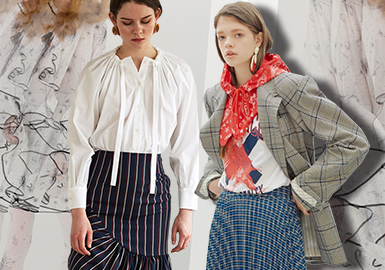 In pre-fall 2019 young women's market, slant placket, drawstringed waist, shirr, pleat, lace and pieced hem are most eye-catching. Slant placket is especially noticeable, carrying a causal and smart style. 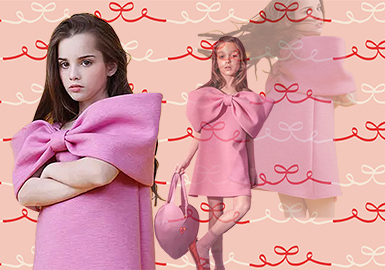 Ethereal and sweet dresses show the beauty of girls. 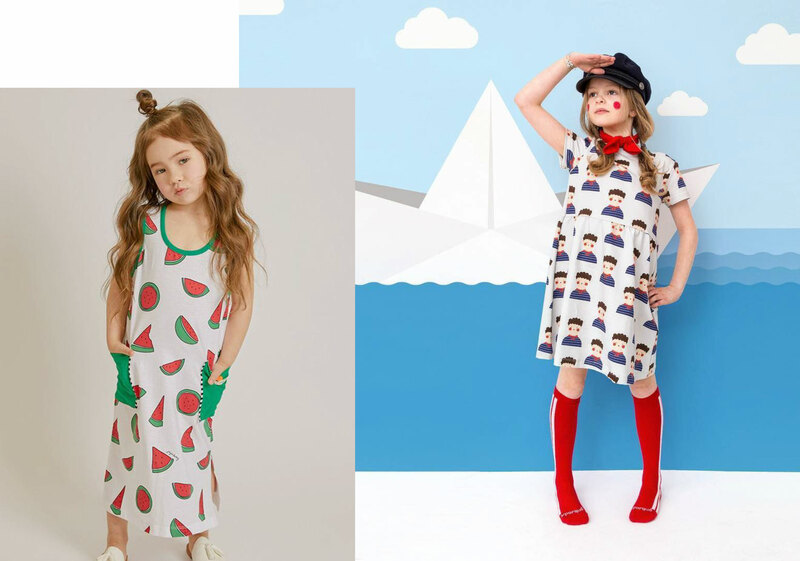 Nowadays, designers attach more importance to kidswear, creating perfect dresses for kids to leave a good memory of fun childhood. Large bright bowknots are bold and fun, adding newness to simple apparel. Dresses are key items in spring and summer. 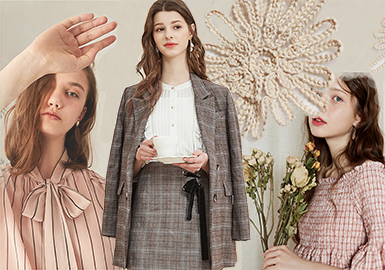 In the Japanese market, sophisticated dresses for mature women employ polka dots, paneling, simple deconstruction or brushstroke patterns to bring newness. 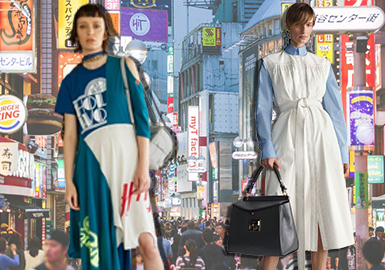 Athleisure styles take up a high proportion in the Japanese market for S/S 2018. Piecing, stripes and letters are frequently used to breathe life into garments. 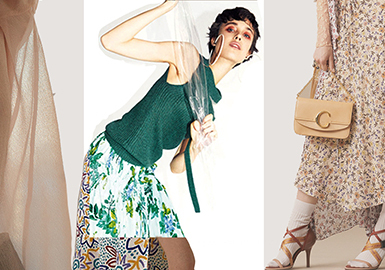 As the summer comes, women can't wait to put on their beautiful dress, the printed dress, retro dot dress and silk dress show off their beauty and elegance. 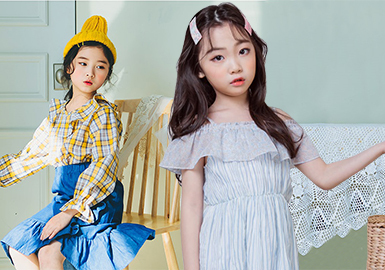 Based on the market analysis, young women's dresses are more feminine with transparent shoulders, polka dot gauzes or mixed materials. Large ruffle makes the clothing more sweet, the application of lace fabric creates a more elegant look. 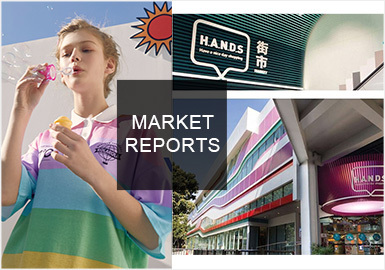 The Nanyou market focuses on original design. 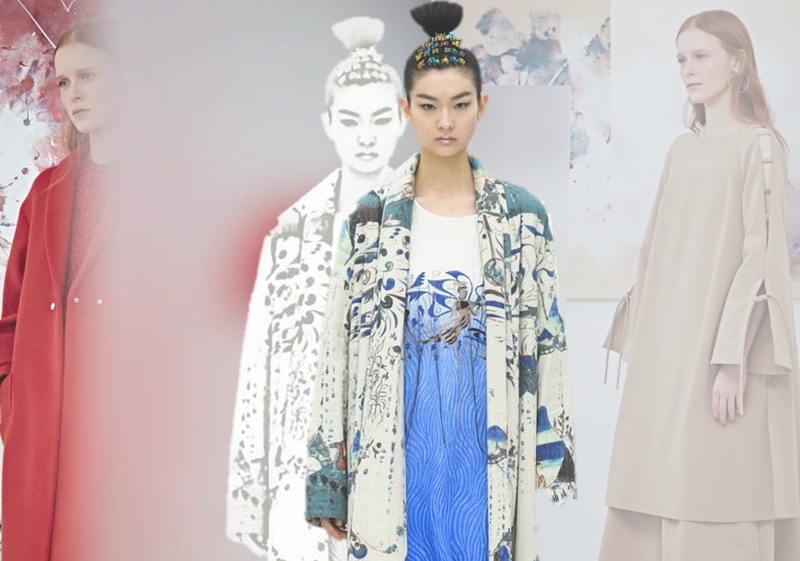 Jinhui Building and Wanho Fashion Design Center gathers hot designer brands like Damo Wangde. This market features oversized, deconstructed silhouettes, Chinese cotton and linen styles and street looks, ideal for mature women.